Welcome to my first giveaway where you can win this adorable kitty cat in black and rainbow colours! This little kitty has been specially made for this giveaway. The bright colours have been chosen to contrast with the black head and body. It would be perfect for a child to carry around or take along in the car or diaper bag. It could also be perfect for adults as a desk top friend to brighten your day. This Giveaway is open to residents age 18+ of USA, UK and Canada (excluding Quebec). Void where prohibited. 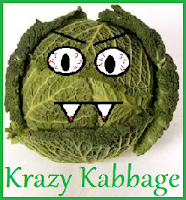 Shipping/Postage will be paid by Krazy Kabbage. Use the Rafflecopter form below to enter this giveaway. All entries are optional but must be completed correctly or will be void. If you need help, have questions or spot and error please contact me via my Krazy Kabbage Facebook Page (link in top right). I love the penguin and the elephant!! I love the Amigurumi Penguin! I would so want one! I love the monkeys! omg so cute! I think the Amigurumi penguin in super cute. I love the Amigurumi Bunny(pink). all of her animals are really cute but the lil monkey is my favorite. Love the cat & the elephant! I voted for your baby on board designs but I think I switched the numbers of votes when I entered them! I also like the Amigurumi penguin. I think it would be cute to do a tiger or a panda. The animals are darling and the perfect size for little hands...we'd love to have an owl in your special style! We see an owl in a nearby tree lately!! the arimugumi penguin is so cute! I love the monkey that is pink and green and would love to see some foods, especially tofu! As a dog lover too, I would love to see a canine crochet amigurumi as well. I love the monkey my grandaughter would love it!